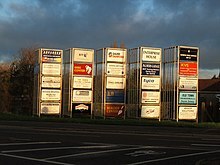 A billboard (also called a hoarding in the UK and many other parts of the world) is a large outdoor advertising structure (a billing board), typically found in high-traffic areas such as alongside busy roads. Billboards present large advertisements to passing pedestrians and drivers. Typically showing witty slogans and distinctive visuals, billboards are highly visible in the top designated market areas. The largest ordinary-sized billboards are located primarily on major highways, expressways or principal arterials, and command high-density consumer exposure (mostly to vehicular traffic). These afford greatest visibility due not only to their size, but because they allow creative "customizing" through extensions and embellishments. Posters are the other common form of billboard advertising, located mostly along primary and secondary arterial roads. Posters are a smaller format and are viewed principally by residents and commuter traffic, with some pedestrian exposure. Some billboard designs spill outside the actual space given to them by the billboard, with parts of figures hanging off the billboard edges or jutting out of the billboard in three dimensions. An example in the United States around the turn of the 21st century was the Chick-fil-A billboards (a chicken sandwich fast food chain), which had three-dimensional cow figures in the act of painting the billboards with misspelled anti-beef slogans such as "frendz don't let frendz eat beef." The first "scented billboard", an outdoor sign emitting the odors of black pepper and charcoal to suggest a grilled steak, was erected on NC 150 near Mooresville, North Carolina by the Bloom grocery chain. The sign depicted a giant cube of beef being pierced by a large fork that extended to the ground. 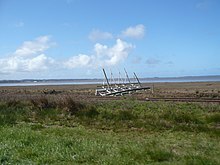 The scents were emitted between 7–10 am and 4–7 pm from 28 May 2010 through 18 June 2010. A digital billboard is a billboard that shows varying imagery and text created from computer programs and software. Digital billboards can be designed to display running text, display several different displays from the same company, and even provide several companies a certain time slot during the day. The constantly changing texts ensure maximum impact and wide exposure to target audiences. The ability to schedule advertisements remotely, in combination with flexible real-time scheduling, has allowed for a decrease in traditional upkeep and maintenance costs. Additionally, digital billboards are continually integrating with real-time advertisement technologies to measure audiences or serve dynamic content. In January 2015, Ooh! Media launched a campaign with Porsche that detected incoming Porsche cars and displayed a dynamic piece of relevant content to Porsche drivers. Billboards may be multi-purpose. An advertising sign can integrate its main purpose with telecommunications antenna or public lighting support. 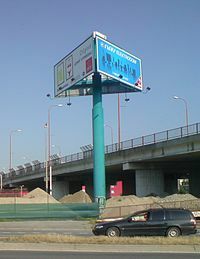 Usually the structure has a steel pole with a coupling flange on the above-fitted advertising billboard structure that can contain telecommunications antennas. The lighting, wiring, and any antennas are placed inside the structure. In 2007, São Paulo, Brazil instituted a billboard ban because there were no viable regulations of the billboard industry. Today, São Paulo is working with outdoor companies to rebuild the outdoor infrastructure in a way that will reflect the vibrant business climate of the city while adopting good regulations to control growth. Surveys of road users show that the lighting provided by billboards provide security and visibility to many motorists. 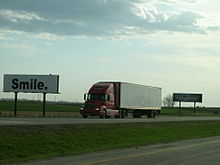 The Federal Highway Administration (FHWA) went on record (Federal Register, 5 March 1999) stating that the agency agrees that appropriately regulated billboards do not compromise highway safety. This statement was made before the release of the FHWA report Research review of potential safety effects of electronic billboards on driver attention and distraction in 2001. What level of regulation is appropriate for billboards in different areas is still under discussion by road safety experts around the world. Billboards are largely absent in Australia's capital city, Canberra, due to a 1937 ordinance which prohibited unauthorised signs on Commonwealth land. In 2017, the Australian Capital Territory considered relaxing this law to allow more outdoor advertising. An Inquiry into billboards received a record 166 submissions, with only 6 respondents supporting allowing more advertising in the Territory. The other submissions supported the current laws, or pointed to shortcomings and loopholes of the current laws, such as the allowance of mobile billboards, bus wrap advertising and political campaign signs, as well a failure to enforce existing laws. In 1964, the negative impact of the over-proliferation of signage was abundantly evident in Houston, Texas, USA and it motivated Lady Bird Johnson to ask her husband to create a law. At the same time the outdoor advertising industry was becoming aware that excessive signs, some literally blocking another, was bad for business. In São Paulo, a city of twelve million in Brazil, Billboards and advertising on vehicles have been banned since January 2007. It also restricted the dimensions of advertising on shop fronts. Billboards are also used to advertise national or global brands, particularly in more densely populated urban areas. According to the Outdoor Advertising Association of America, the top billboard advertisers in the United States in 2017 were McDonald's, Apple and GEICO. A large number of wireless phone companies, movie companies, car manufacturers and banks are high on the list as well. Non-commercial advertisement is used around the world by governments and non-profit organisations to obtain donations, volunteer support or change consumer behavior. North Dakota, May 2004. The Traffic Audit Bureau for Media Measurement Inc. (TAB) was established in 1933 as a non-profit organization whose historical mission has been to audit the circulation of out-of-home media in the United States. TAB's role has expanded to lead and support other major out of home industry research initiatives. Governed by a tripartite board composed of advertisers, agencies and media companies, the TAB acts as an independent auditor for traffic circulation in accordance to guidelines established by its board of directors. Late 15th century – Flyposting was widely practiced throughout Europe. 1796 – Lithography was invented, making real posters possible. 1835 – Jared Bell was making 9 × 6[clarification needed] posters for the circus in the U.S.
1871 – Fredrick Walker designed one of the first art posters. 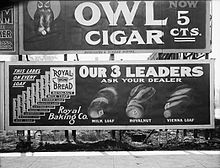 1889 – The world's first 24 sheet billboard was displayed at the Paris Exposition and later at the 1893 World's Columbian Exposition in Chicago. The format was quickly adopted for various types of advertising, especially for circuses, traveling shows, and movies. Early 1900s – Poster art schools were established in England, Austria and Germany. 1908 – The Model T automobile was introduced in the U.S., increasing the number of people using highways and therefore the reach of roadside billboards. 1919 – Japanese candy company Glico introduced its building-spanning billboard, the Glico Man. 1925 – Burma-Shave made billboards lining the highways. 1936 – The Wall Drug billboards started to go up nationwide. 1960 – The mechanized Kani Doraku billboard was built in Dotonbori, Osaka. 1965 – The Highway Beautification Act was passed after much campaigning by Lady Bird Johnson. 1971 – The Public Health Cigarette Smoking Act banned cigarette ads in television and radio, moving that business into billboards. 1981 – The Supreme Court overturned a San Diego billboard ban, but left room open for other cities to ban commercial billboards. 1986 – Non-television advertising became restricted – as now, non-television adverts could not show people smoking. This meant that Benson & Hedges and Silk Cut, amongst other brands, advertised their cigarettes through increasingly indirect and obscure campaigns to a point where they became recognizable. 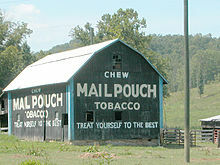 1998 – The four major U.S. tobacco companies signed the Tobacco Master Settlement Agreement, which eliminated billboard advertising of cigarettes in 46 states. 2007 – The industry adopted one-sheet plastic poster replacement for paper poster billboards and began the phase-out of PVC flexible vinyl, replacing it with eco-plastics such as polyethylene. 2010 – The first "scented billboard", emitting odors similar to charcoal and black pepper to suggest a steak grilling, was erected in Mooresville, North Carolina by the Bloom grocery chain to promote the sale of beef. 2010 – Augmented billboards were introduced in the Transmediale Festival 2010 in Berlin using Artvertiser. ^ Aronoff, Jen (3 June 2010). "Eau de marketing, with hint of pepper". The Charlotte Observer. Archived from the original on 5 June 2010. Retrieved 8 June 2010. ^ "Beck's Playable Poster". novalia.co.uk. ^ Gillian West. "Beck's creates 'playable-poster' for musical campaign supporting New Zealand Music Month". The Drum. ^ "Beer brand launches hi-tech playable posters for NZ Music Month". The National Business Review. ^ Cairney, P., & Gunatillake, T. (2000). Does roadside advertising really cause crashes? Paper presented at the Road Safety: research, enforcement and policy., Brisbane, Australia. ^ Wallace, B. (2003). Driver distraction by advertising: genuine risk or urban myth? Municipal Engineer, 156, 185–190. ^ Fettes, James (19 June 2017). "Why doesn't Canberra have billboard advertising?". Curious Canberra. ABC Canberra. Retrieved 18 July 2018. ^ Burgess, Katie (25 January 2017). "ACT may relax its ban on billboards". The Canberra Times. Retrieved 18 July 2018. ^ a b Standing Committee on Planning and Urban Renewal (October 2017). "Inquiry Into Billboards, report 2" (PDF). Australian Capital Territory Legislative Assembly. ^ a b Burgess, Katie (22 February 2018). "Government flags further review of billboard laws as Greens call for crackdown on illegal advertising". The Canberra Times. Retrieved 18 July 2018. ^ a b McAuley, Ian. "Awfulising Canberra". Archived from the original on 23 March 2018. Retrieved 18 July 2018. ^ Baker, Emily (18 February 2018). "Canberra billboard ban: New polling shows disapproval for relaxing of laws". The Canberra Times. Retrieved 18 July 2018. ^ McCrea, Lynne (15 January 2008). "Billboard ban turns 40". Vermont Public Radio. Colchester, VT. Retrieved 8 June 2010. ^ "Group Wants Wienermobile Banned From Hawaii". WPTZ Plattsburgh. Honolulu. 24 July 2009. Archived from the original on 19 July 2011. Retrieved 8 June 2010. ^ "Billboard ban a law". 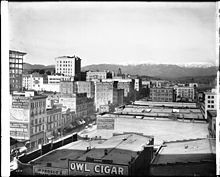 Portland Press Herald. 29 July 2007. Archived from the original on 18 April 2009. ^ Rohter, Larry (12 December 2006). "Billboard ban in São Paulo angers advertisers". New York Times. Retrieved 13 February 2013. ^ "Unauthorized Use or Occupation". www.th.gov.bc.ca. ^ "Toronto billboard tax approved". Canadian Broadcasting Corporation. 7 December 2009. Archived from the original on 3 August 2012. Retrieved 8 June 2010. ^ Trevision, Catherine; Wozniacka, Gosia (12 August 2007). "Billboards pit beauty vs. business". The Oregonian. Archived from the original on 31 October 2007. Retrieved 26 December 2007. ^ Outdoor Advertising Association of America, Inc. "Top OOH Advertisers". oaaa.org. Retrieved 10 May 2018. ^ Koekemoer, Ludi; Steve Bird (2004). Marketing Communications. Juta and Company Limited. p. 71. ISBN 0-7021-6509-3. ^ Judd, Ron (2 April 2003). "Freeway billboard barbs a sign of what free speech really means". The Seattle Times. Chehalis. Archived from the original on 7 December 2010. Retrieved 8 June 2010. ^ Henderson, Sally; Landau, Robert (1981). Billboard Art. San Francisco, CA: Chronicle Books. pp. 9–10. ISBN 0-87701-167-2. This page was last edited on 1 April 2019, at 15:00 (UTC).